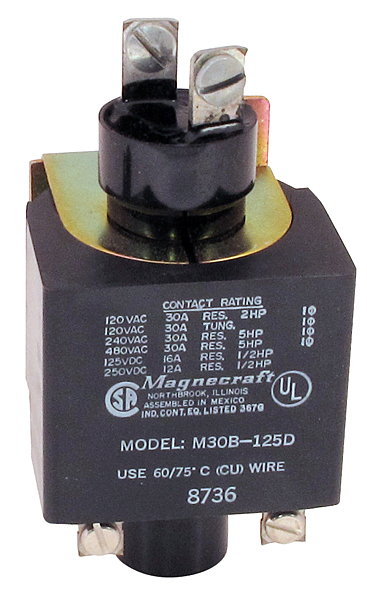 Magnecraft mercury contactor relay. SPST, normally open. 30 amp to 480v AC. 48v DC coil, 15 amp @ 125v DC. 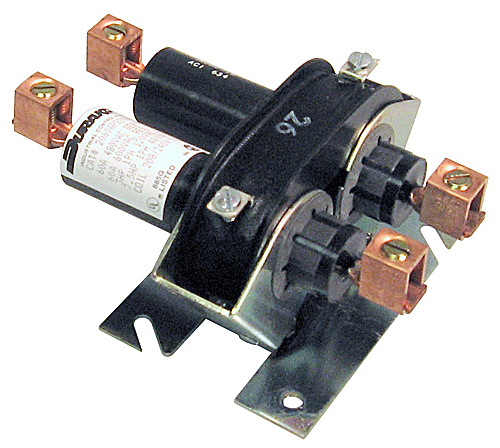 2" x 2-3/8" x 4-1/4"L.
Magnecraft 2 pole mercury contactor relay. DPST, normally open. 35 amp @ 120 - 480v AC, 24v DC coil. 98 ohm. 3-1/2"W x 2-3/8"D x 4-3/4" overall height. NSN: 5945-01-025-2633. 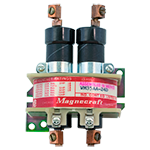 Magnecraft 1PST normally open contactor. Made to switch 30 amp, 120 / 480 vac equipment and 16 amps 125 vdc equipment. Single phase. 12 vdc control coil. 2-1/4" x 2" x 4-1/4" high. Normally sells for $65. We now have 1,000 pcs in stock new in factory boxes. Durakool SPST normally closed mercury contactor. Made to switch 30 amp @ 120v equipment and 10 amps @ 480v equipment. 24 vac control coil, 60 Hz. 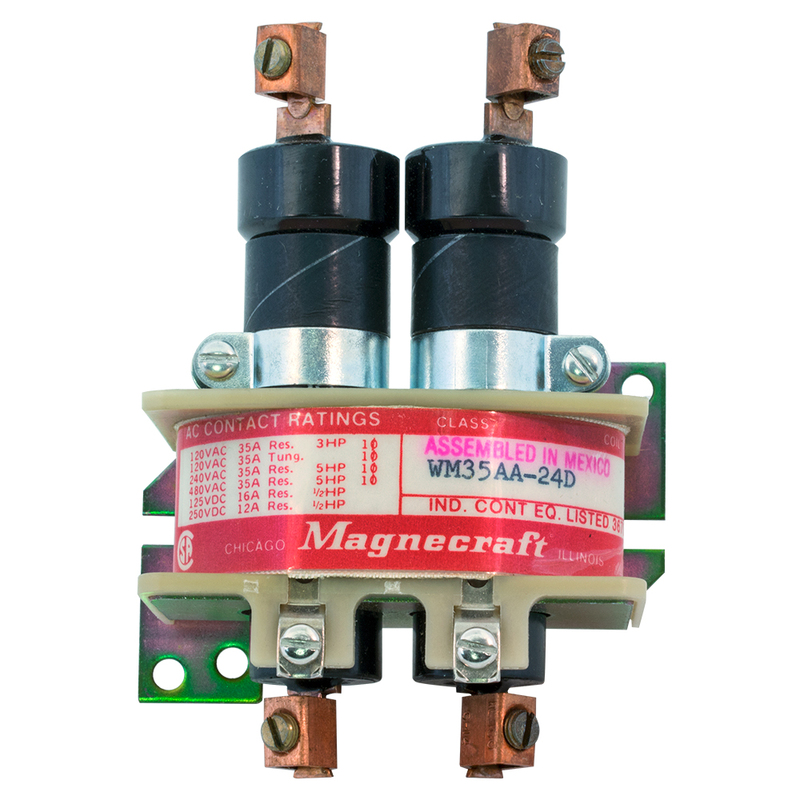 2"D x 3-1/2"L.
Magnecraft 1 pole mercury contactor relay. 1 pole, normally closed. 30 amp, 125 vdc coil. 2" x 2-1/2" x 5". 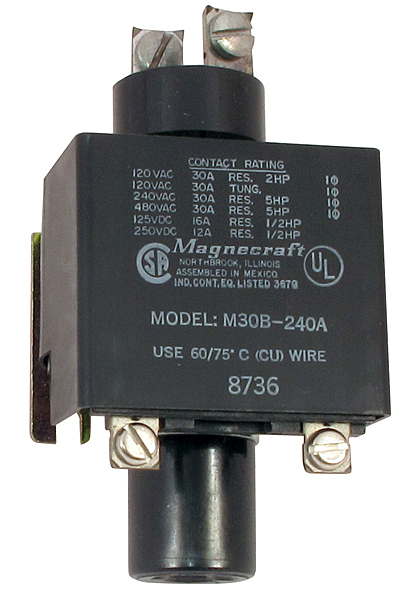 Magnecraft 1 pole mercury contactor relay. 1 pole, normally closed. 30 amp, 240 vac coil. 2" x 2-1/2" x 5". 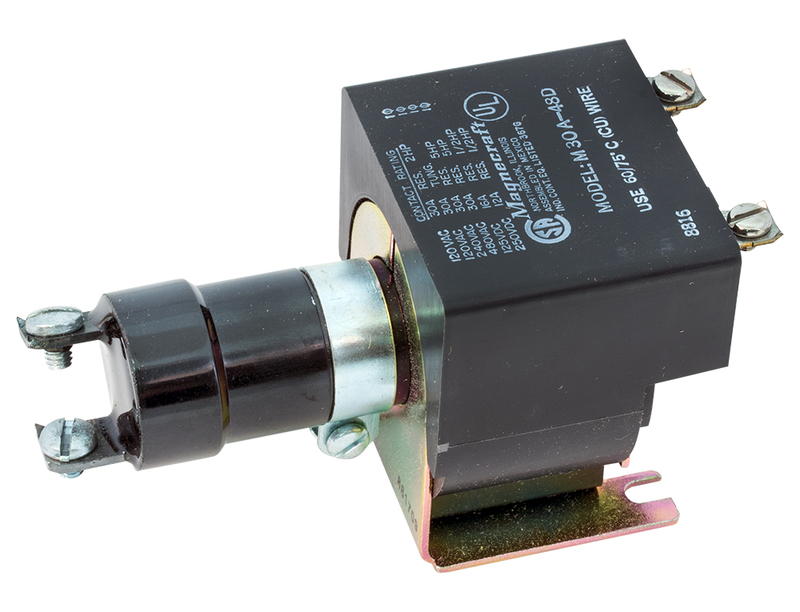 MDI mercury contactor relay. SPST, 60 amp @ 480v. 24v DC coil. 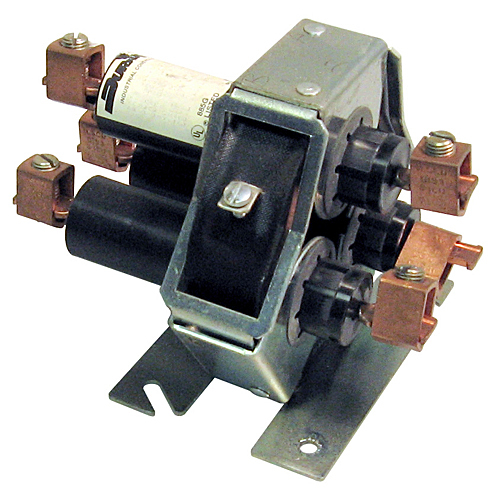 1-3/4" x 2-1/4" x 4-1/4"H.
Magnecraft 2 pole mercury contactor relay. 2 poles, both tubes normally closed. 60 amp, 120 vac coil. 2-1/4" x 3-1/2" x 4-5/8". 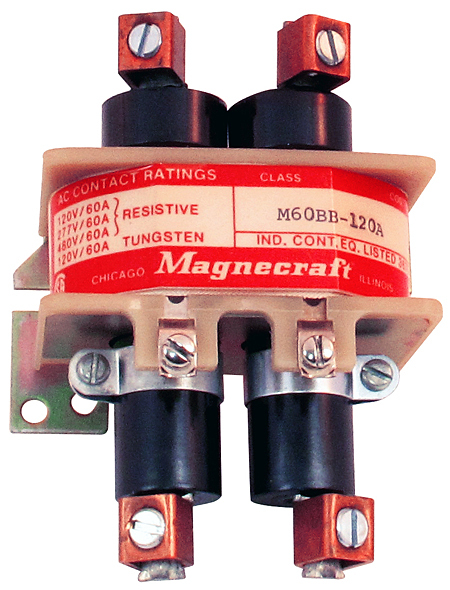 Magnecraft 3PST normally open contactor. 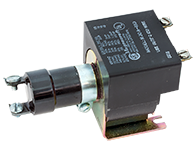 Made to switch 60 amp, 120 / 480 vac equipment and DC equipment at reduced ratings. Use on single or three phase projects. 24 vdc control coil. 3-1/4" x 3-1/2" x 5" high. Durakool 2PST normally open contactor. 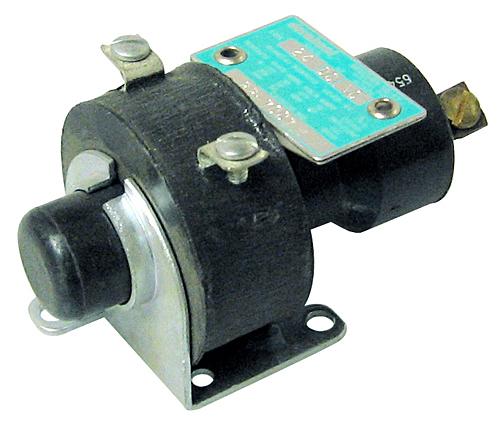 Made to switch 60 amp, 120 / 600 vac equipment and DC equipment at reduced ratings. 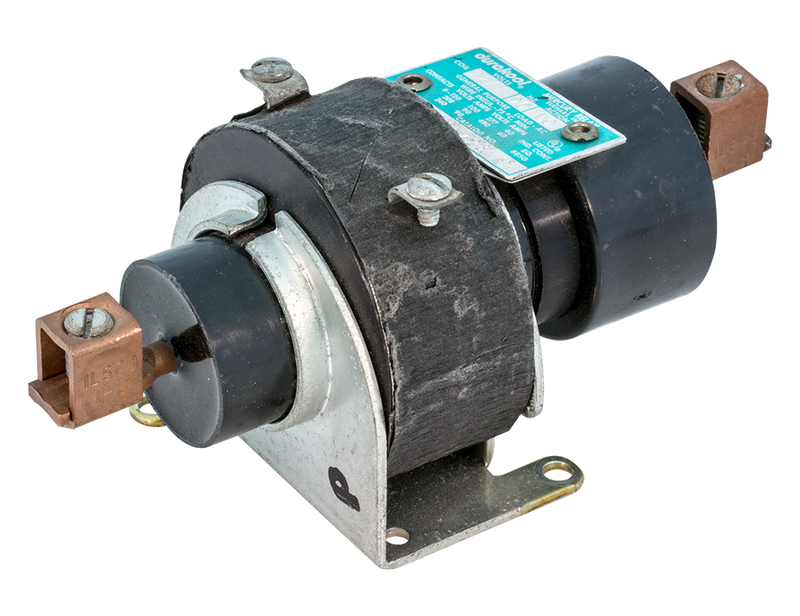 208 / 240 vac 50/60 Hz control coil. 4" wide x 2-1/2" deep x 5-1/4" high. Newark price $165. MDI (Mercury Displacement Industries) 3PST normally open contactor. 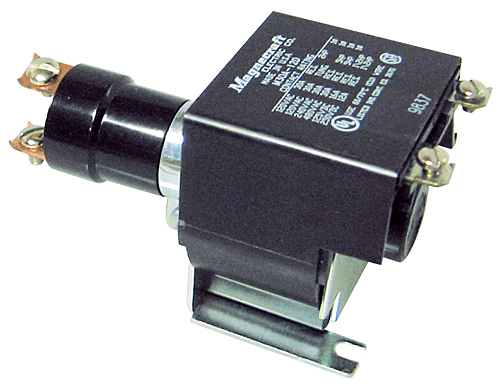 Made to switch 35 amp, 120 / 600 vac equipment and DC equipment at reduced ratings. 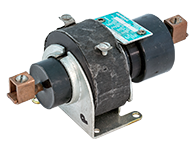 Use on single or three phase projects. 220 / 240 vac, control coil. 3-3/4" x 4-1/4" x 4" high. 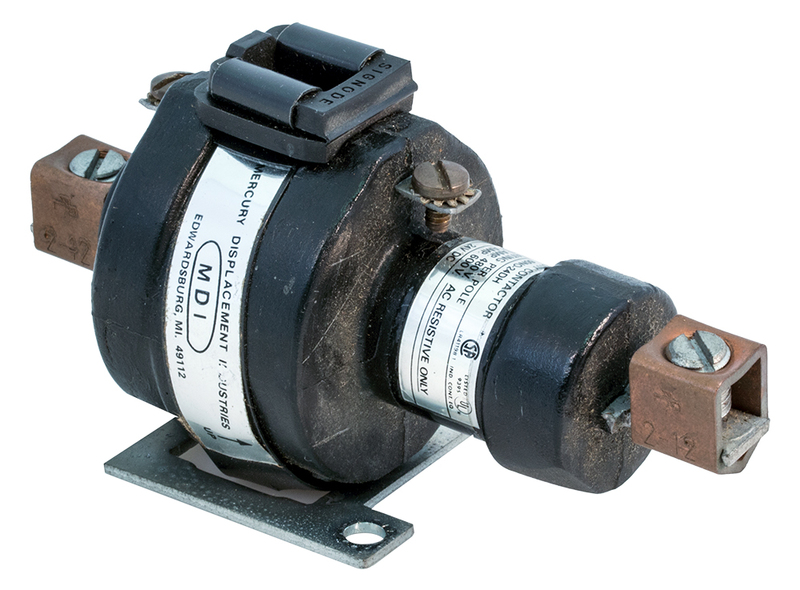 MDI mercury contactor relay. 3 phase, normally open. 12v coil, 35 amp, 480v. Removed from service but very clean. MDI (Mercury Displacement Industries) 3PST normally open contactor. Made to switch 60 to 80 amp, 120 / 480 vac equipment. Use on single or three phase projects. 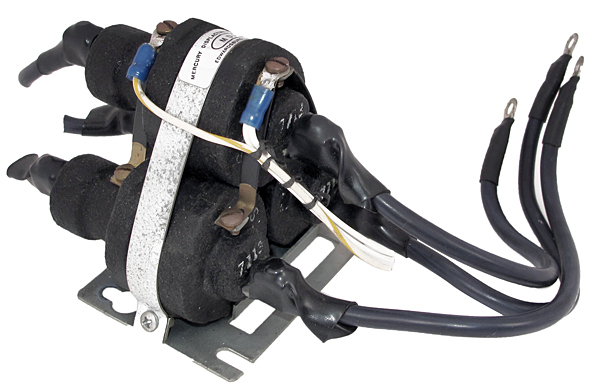 120 vac control coil. 3-3/4" square x 4-1/2" high. Durakool 3PST normally open contactor. Made to switch 60 amp, 120 / 600 vac equipment. Use on single or three phase projects. 208 / 240 vac control coil. Newark price $243. Durakool mercury contactor relay. SPST, normally open. 24v DC coil. Rating: 100 amp @ 6 - 120v, 90 amp @ 208 - 240v, 60 amp @ 277 - 480v. Used, excellent condition.